Last night we had the best dinner so far. 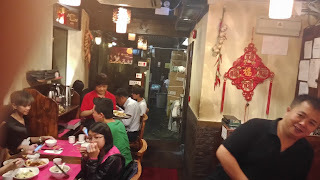 We went to Yu, 4 Yiu Wa Street, Causeway Bay, a small Sichuan restaurant just two block away from Time Square. We were lucky to get a table as we arrived, later there was a constant queue outside. We had an assortment of dishes, the killer dish was woked chicken with peanuts and asparagus. Spicy, but not fiery, with Sichuan pepper, contrasted by a hint of cardamom. We will be back for more shortly! Today we are going back to Central to look at an apartment. It may be our next home.